Will We Find Other Planets Like Earth? 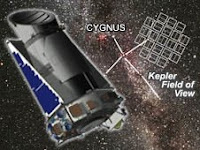 The “fun” has begun for NASA’s Kepler spacecraft, says William Borucki, the mission’s science principal investigator. In other words, the spacecraft has started its search for other Earth-like planets. It will look in what are called the “habitable zones” of our galaxy—regions at distances from stars (like our sun) where the temperature allows possible lakes and oceans to exist. Water, it’s believed, is necessary to support primitive life. For the next three and a half years, Kepler will look for signs of these other habitable planets by staring at more than 100,000 stars. If planets are orbiting a star, its brightness will dull when the planet crosses in front of it and partially blocks the light.